How well do your understand your ideal buyer? As sales and marketing becomes more complex, creating a successful lead generation strategy means you first make time to figure out who you're marketing and selling to. 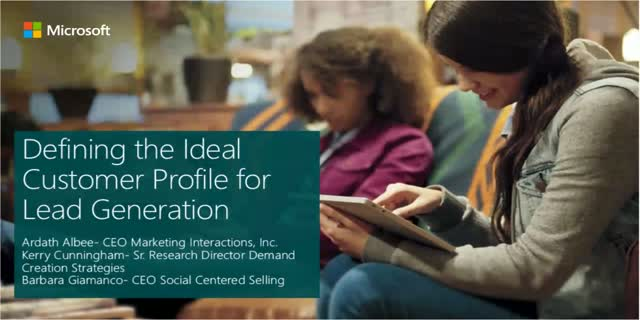 Defining the profile of your ideal buyer focuses your sales and marketing efforts on generating high quality sales leads through targeted messaging at various stages in the buyer’s journey. Join Ardath Albee, B2B Marketing Strategist and CEO Marketing Interactions, Inc., Kerry Cunningham, Senior Research Director at Demand Creation Strategies, and Barbara Giamanco, CEO of Social Centered Selling for this all-about-lead-gen webinar!